Martin McGuinness and Peter Robinson sat side by side at the Wall Street 50 event organized by our sister publication Irish America magazine in New York on Thursday night and seemed the best of colleagues. At the podium when they spoke separately, the First Minister Robinson praised McGuinness and Deputy First Minister McGuinness did the same when it was his turn. The two men and their parties, the Democratic Unionist party and Sinn Fein effectively govern Northern Ireland in a power sharing arrangement that has confounded the world for almost six years now. Before Robinson, back in 2007 it was the Reverend Ian Paisley who first partnered with McGuinness as the world stood agape. For the 300 guests drawn from Irish Wall Street seated amid the soaring architecture and array of model yachts that took part in the Americas Cup, little seemed out of the ordinary. Yet it was an extraordinary moment to witness, the leaders of the two ethnic tribes in Northern Ireland, sharing power and sharing each other’s success. Robinson was impressive, outlining in detail how Northern Ireland has come through ethnic conflict and British-Irish tensions that devastated generations since partition. It can’t have been easy for him, facing an Irish American crowd which unionists are often uncomfortable facing, but he handled it very well. McGuinness was his usual ebullient self, utterly at home, relating the struggle of the Irish in America and reflecting on how lucky we all were sitting in the Yacht Club that those who came before us had allowed us this opportunity. But behind the warm rhetoric and pleasant words there is a reality that all is not well in the power sharing government. You would never have known it but McGuinness and Robinson have been at deep loggerheads ver several issues, most notably Loyalist violence which led to a long hot summer this year. When dissident Republicans have committed violent acts, when policemen have been killed, McGuinness has been forthright and out front about condemning them. Yet McGuinness says when the opposite happens and Loyalist riot and policemen are hurt Robinson stays silent. In addition, Robinson has changed his stance on the creation of a peace center on the site of the old H Blocks, a massive project which renowned world architect Daniel Libeskind creator of the new World Trade Center, was due to build. That was a shattering blow for McGuinness who saw the new project as a massive job booster for the area and a long term tourism and cultural and historical landmark. 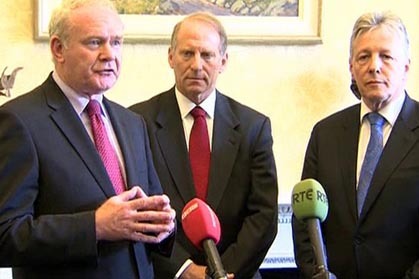 The good news is that Richard Haass former American special envoy to Northern ireland will be returning to the North to seek a way forward in sorting out the difficulties. He will have a very tough task, parades, loyalist violence and tension between Sinn Fein and DUP are long standing issues at this stage which have proven very hard to counter. But I’lll bet on old fashioned American know how and insight in helping frame a solution. The Irish peace process is studied in almost every conflict resolution area in the world. Its’ success has allowed two communities to grow to a certain point of accommodation but as was revealed this week there is some ways to go. But imagine the alternative to the scene we witnessed at the New York Yacht Club-- a continuing spiral of violence an endless propaganda war between British and Irish as to who was right and wrong, deaths and injuries as regular media fare ? We really have had the luck of the Irish on this one.